Douglas Wood’s short stories and poetry have appeared in Narrative Magazine, The Rattling Wall, Coachella Review, Connotation Press, Rise Up Review, and Writers Resist among others and he was a featured author in the New Short Fiction Series. He received his MFA in creative writing from UCR/Palm Desert. A child of the Midwest, Douglas lives in Los Angeles and while he does not miss the change of seasons, he does miss gluten. As a playwright, lyricist or composer, Douglas has had twelve plays produced in Chicago, Los Angeles, New York and elsewhere, including the Expense of Spirit which was selected for presentation in New York for the Gay Games IV. 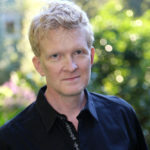 Because of his theatrical and singing background, Doug very much enjoys doing readings and has been called to participate in many reading series in the Los Angeles area, including Dirty Laundry Lit, Tongue and Groove, Lit Crawl, Writer’s Resist, and AWP at the Last Bookstore, among others. Sometimes he sings a little. Sometimes he uses a German accent. You never know. If you want to send him an email, the address is Doug@DouglasWood.net. Follow Doug on Twitter @DouglasWoodbaby.